The PGA TOUR announced that more than $6 million from The Presidents Cup 2015 at Jack Nicklaus Golf Club Korea, a record-setting amount for this prestigious competition, will be distributed to charitable causes around the world as chosen by the 33 players, captains, vice-captains and captain’s assistants, as well as to the Pearl S. Buck Foundation and to help launch The First Tee Korea. Since the inception of The Presidents Cup in 1994, more than $38.4 million has been raised for charity from event proceeds. Over the past 21 years, The Presidents Cup has impacted more than 450 charities in 15 countries worldwide and 35 states in the U.S. The Presidents Cup, a team match-play competition featuring 24 of the world’s top golfers – 12 from the United States and 12 from around the world, excluding Europe – is held every two years, and since 1996 has alternated between United States and international venues. In October, the U.S. Team retained the Cup from the Internationals in one of the most thrilling events to date at Jack Nicklaus Golf Club Korea in Songdo IBD, Incheon City, Korea. 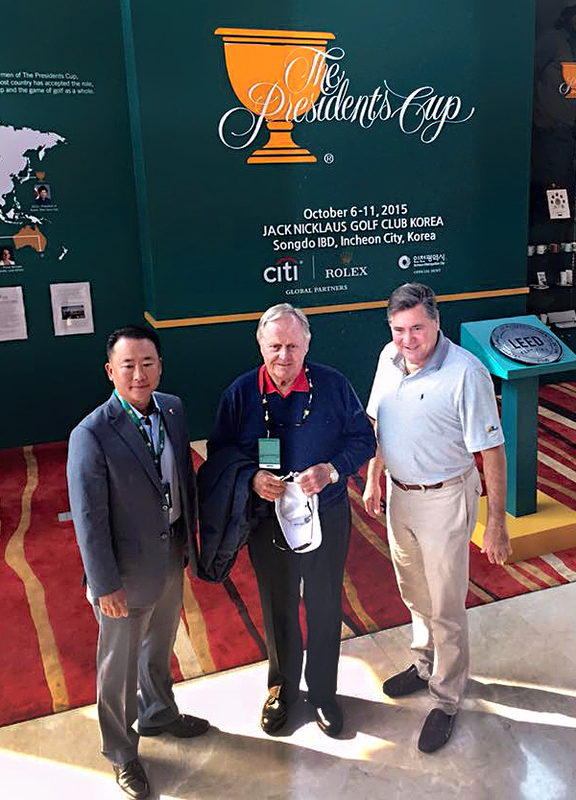 It was the first time The Presidents Cup was held in Asia, and marked the third year in a row the game’s most prestigious international team competitions (The Presidents Cup and Ryder Cup) were held at a Jack Nicklaus-designed golf course. In addition to the money allocated by event participants, $100,000 in funding for the Pearl S. Buck Foundation and more than $1 million for the establishment of The First Tee Korea was generated by, through and because of The Presidents Cup, resulting $1.177 million being returned to these Korean-based charities. “Our goal for every Presidents Cup is to look back and know that it was better and more successful than the event prior, in all aspects,” said PGA TOUR Commissioner Tim Finchem. “The thrilling finish provided by the teams at Jack Nicklaus Golf Club Korea was the pinnacle of memorable moments in golf, the welcome by the Korean fans was unmatched, and with today’s announcement of $6 million-plus to charities around the world, we are able to celebrate a significant milestone in charitable giving as well. “I’d like to thank every player, captain, vice-captain and captain’s assistant for putting on a great display of camaraderie, sportsmanship and competitive fire in October, and also for reaching into their communities and to charities around the world to put these dollars to good use. Led by captains Jay Haas and Nick Price, the U.S. and International Teams provided one of the most memorable and closely contested competitions in The Presidents Cup history, as 24 of the world’s best golfers squared off over four days of thrilling play that came down to the very last hole on Sunday. Although the U.S Team captured The Presidents Cup for the sixth consecutive time and ninth overall, the event will be remembered for the edge-of-your-seat excitement provided by an International Team’s Sunday comeback that fell just short. Korea’s hero, Sangmoon Bae, squared off against Bill Haas in the last Singles match, which went to the very last hole before Haas secured victory for his teammates and his father. Haas became just the second captain’s pick in history to clinch The Presidents Cup. The Presidents Cup 2017 will be held at Liberty National Golf Club in Jersey City, N.J., September 25–October 1.